The monthlong exhibition, which is being housed in the temporary exhibition space in the south western part of the museum, opens to the public Wednesday. The display boards, which communicate to the public the significance of the city’s heritage, juxtaposed with other materials of historic interest, will later become part of the museum’s permanent collection, Manik said. “We are giving those who are interested, including students and tourists, the opportunity to explore the city’s history,” he said. The exhibition retells the history of Jakarta from the 16th century when it was a traditional seaport city, known as Sunda Kelapa and next Jayakarta, through to the 18th century when it was transformed into a colonial city and renamed Batavia under the Dutch colonial administration, commonly known as the Verenigde Ost-Indische Compagnie (VOC) or the United of East-Indian Company. For centuries, the Dutch administration’s office was located in the museum building. The traditional city was born after the prince of the Central Java-based Islamic Kingdom of Demak, Falatehan — also known as Fatahilah — led Muslim troops and conquered Sunda Kelapa, which was ruled by the Bogor-based Kingdom of Sunda, on June 22, 1527. The Kingdom of Demak also defeated the Portuguese during the battle, who had teamed up with the Kingdom of Sunda against them. Prince Fatahilah changed the name of Sunda Kelapa to Jayakarta, which means great deed or great victory, while the date — June 22 — has become Jakarta’s birthday. The office of the Jayakarta government was in Kali Besar, North Jakarta. Part of the old building was transformed into the Omni Batavia Hotel. Prince Jayakarta, who took over from Prince Fatahilah in 1596, progressively shaped the city similar to those where Islamic kingdoms ruled. As a result, the city, then called Jayakarta, soon became known as the traditional city. Prince Jayakarta’s progressive policies, which gave traders from China, India, England, Persia, Saudi Arabia and the Netherlands the chance to open businesses here, eventually resulted in a blow. Conflicts erupted when the prince allowed Dutch traders to trade and stay in the city to keep their belongings under guard. Tensions grew between the prince and the VOC when it appointed in 1619 Jan Pieterszoon Coen as its representative in Jayakarta. The prince’s lost his power to the VOC on May 30, 1619. Coen had by then changed the city’s name to Batavia, which it was called until 1942. According to archeologist at the city culture and museums agency Candrian Attahiyat, the then governor general shaped Batavia based on a structural concept back in the Netherlands. “J.P. Coen placed buildings very close to one another. The building concept he applied was more appropriate for countries with cool climates,” Candrian said. As a result, he said, many of the people who lived in Batavia moved south to the area where Lapangan Banteng field and National Monument park are now situated, in search of a healthier lifestyle. “However, the number of deaths at that time has never been officially reported,” Candrian said. According to Manik, deaths other than from diseases also occurred in 1740 when the Dutch massacred around 40,000 people of Chinese ethnicity because they protested the trading policies imposed by the VOC. Some reports say the number of people who died in the massacre reached only 5,000. Manik said the data used in the exhibition was developed through one year of cooperative research between historians of the University of Indonesia, the Netherlands National Archive in Den Haag and officials at the Netherlands Embassy. “We got around 80 percent of the history from the Netherlands National Archive and compiled it with ours,” he said. Manik said he was assured the Netherlands’ version had never been engineered as the Dutch historians worked independently and the manuscripts had never been changed. Candrian said it was hard to trace Jakarta’s history without support from the Netherlands National Archive. “Our people don’t have a writing habit. 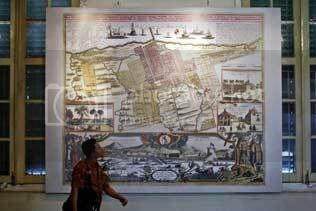 So, we have never had Jakarta’s history written from our point of view,” he said.